Working with long time strategic partners: Sellen Construction, ZGF Architects, and KPFF Consulting Engineers, GRPC is proud to announce the award of the design build contract on the Recovery and Redevelopment of the Federal Center South Building (FSC) in Seattle. As the local headquarters of the Army Corps of Engineers, the new building will perform within the top 1% of energy-efficient office buildings in the U.S., receiving LEED-Gold certification and is tracking 79 points towards Platinum requirements. GRPC was responsible for the timber reclamation from the existing building which was re-manufactured for use in the new building.. 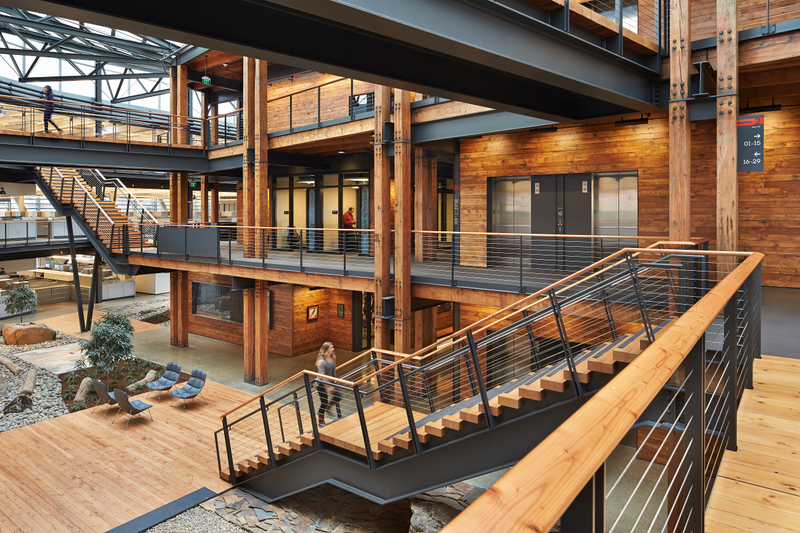 Larger reclaimed timbers provided the columns and beams in the glass atrium; reclaimed decking provided both horizontal and vertical wall coverings, smaller timbers for the materials for stairways, bridges and landings. In order to provide the needed materials, GRPC will process over 150,000 BDFT of timbers and nearly the same of 2 x 6 decking. The U.S. General Services Administration (GSA) invested Recovery Act funding to develop and transform an existing warehouse into modern, green, sustainably built offices with extensive use of natural light, state-of-the-art thermal heating systems, rainfall reclamation along with the conversion of extensive hardscape into low impact, sustainable green space. 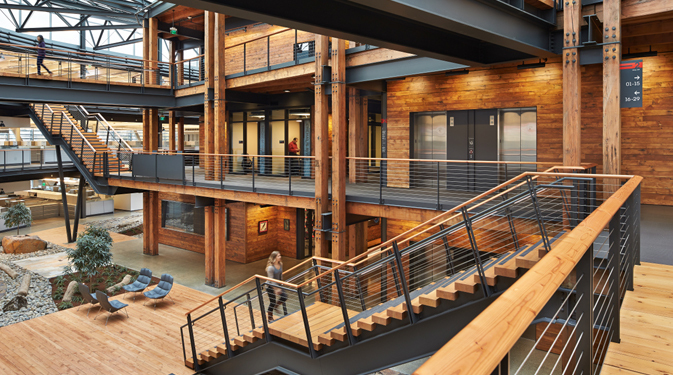 The GSA is committed to creating a more sustainable, better performing federal building portfolio and FSC in Seattle offers an excellent model for both the public and private sector to emulate.